The long, tumultuous history at the bargaining table between the Buffalo Public Schools and its teachers union lived on Tuesday. It was the first day of negotiations between the school district and the Buffalo Teachers Federation, and the two sides sat down only to lay out ground rules for negotiating a new teachers contract. The current pact expires at the end of June. An hour in, BTF President Philip Rumore and three other members of his team walked out – setting an early tone for what may be tough negotiations ahead. The union wanted the two sides to schedule a minimum of two negotiating sessions in advance, while the district wanted one. “They were adamant and I said, ‘Then we’re out of here,' ” explained Rumore, who relayed the story to The Buffalo News, after the first session broke down. 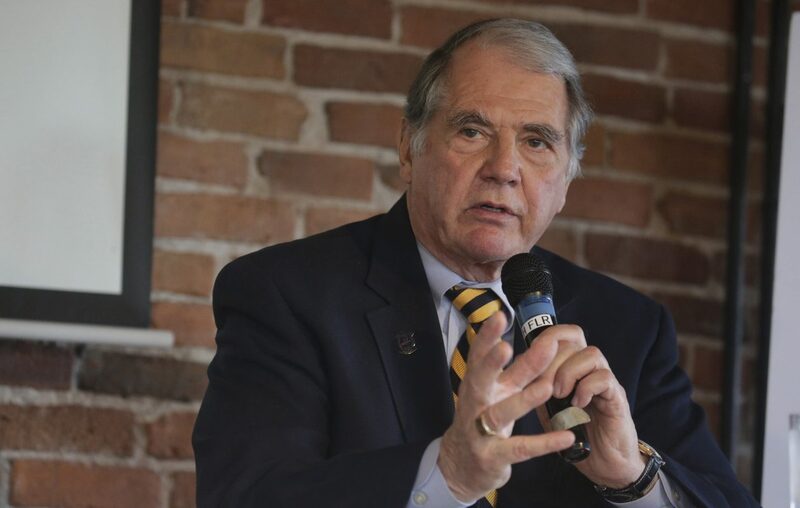 “In all my years of negotiating, there has never been a time where both sides didn’t want to schedule as many sessions as possible in advance,” said Rumore, the longtime BTF leader. “They are always tentative as circumstances change; however, it allows for people to plan, clear their schedule and make progress more quickly." Rumore said previously that he was hoping to ratify a new agreement by the end of the school year. “To me the message is loud and clear,” Rumore said. “They want to delay negotiations." Walking out of the room during negotiations is a tactic Rumore has used often, said Nathaniel J. Kuzma, general counsel for the Buffalo Public Schools and the district’s lead negotiator. Is this a sign of what’s to come? The last teacher contract in Buffalo was ratified in 2016, ending a 12-year stalemate between the school district and teachers. Neither side has spoken publicly about its proposals. The last time around, teachers got a 10 percent pay hike the first year, to make up for all of the years without a new deal, and 2 percent each of the following two years. Shortening the length of time it takes Buffalo teachers to reach their maximum salary – 27 years – was one of the issues left on the table during the last round of negotiations, so that may be on the agenda again. In general, expect the district to seek more flexibility from the new teacher contract. The last time, the district got rid of the controversial cosmetic surgery rider and – for the first time ever – got teachers to pay toward their health insurance, so it's a safe bet the district will continue to chip away at the cost of health care, during negotiations. No other bargaining sessions have been scheduled. All nine seats on the Buffalo School Board will be on the ballot May 7. Stay informed by signing up for News Education Reporter Jay Rey's weekly email here.